Directed by Danish-born helmer Natasha Arthy, this film can be described as a more seriously minded martial arts version of the Gurinder Chadha comedy Bend It Like Beckham, in which our protagonist must make a decision between staying loyal to her family’s traditional values and the one thing she loves more than anything. Aicha is a young Turkish high school student living in Denmark. Her parents expect the best of her in terms of education as they hope she follows in the footsteps of older brother Ali and become a doctor. However, Aicha has another passion and that is the art of Chinese kung fu. Having learned for three years, Aicha is kicked out of the school she has studied the art in after a scuffle with a cocky fighter. However, her teacher does see potential in Aicha and recommends her to try out another school. Upon entering the Dragon Kung Fu club, Aicha meets the sifu and proves to be a worthy member of the team. Even more, Aicha catches the eyes of Danish fighter Emil, who begins to fall for her while they train for an upcoming tournament. However, there poses a problem. Ali is to be engaged to Turkish girl Jasmine, who catches Aicha with Emil and the rumors begin. Things get worse when Omar, a new member at the Dragon Kung Fu school, is revealed to be the best friend of Jasmine’s brother Mehmet. Jasmine soon learns that she is also failing in school. She discovers she must choose between her loyalty to her family and the one thing she feels makes her happy. This Danish film is quite a look not only for the fact that it is a martial arts film, but it is more than just a martial arts film. It becomes a character study about a young woman who becomes conflicted when the one thing that makes her happy, martial arts, becomes a threat to her traditionalist Turkish family. The ideas of choosing between cultural traditions and happiness was done in a comical sense in the hit British comedy Bend It Like Beckham, in which a young woman felt conflicted between her traditional Indian family and her love of soccer. Danish-based Turkish actress Semra Turan makes a very good debut performance as the conflicted Aicha. She plays Aicha as someone who has to deal with so many conflicts, from not only the family values and love for martial arts, but in an aspect, possibly finding love with a non-Muslim. While she tends to constantly deny it, she seems to have an attraction towards kung fu school classmate Emil, played by Cyron Melville. Yet, she puts her traditional values first when it comes to her relationship and at the same time, is somewhat disgusted when her mother tries to set her up with Turkish bad boy Mehmet, played by Ertugrul Yilan, who sports a combination of facial hair and sideburns that make him look like a terrible Wolverine clone. There is a subplot in the film, one that revolves around Aicha’s older brother Ali. Ali, a successful doctor, has been in love with local Turkish girl Jasmine and their relationship is a solid subplot for the film. The reason behind this is because Aicha’s actions soon come out to somehow affect the relationship and not exactly in a good way. The rumors begin to fly about Aicha and Emil, and this causes the entire family, including Ali, to disown Aicha. However, something even more shocking awaits this lovely couple. Xian Gao, a martial arts master who is perhaps best known as Master Bo in the Ang Lee wuxia film Crouching Tiger, Hidden Dragon plays the sifu of the Dragon Kung Fu school, who becomes somewhat of a second father figure to Aicha when her own father feels she is nothing more than a failure in his eyes. The sifu sees potential in Aicha and wants her to only do her best. In addition, Gao served as the film’s fight choreographer. The film’s fight scenes are not too bad, despite the use of some minimal wirework for some flips mainly. However, one example of an exaggerated use of wirework is used for a dream sequence in which Aicha constantly finds herself at the mercy of an unknown assilant. This scene is shown a few times over the course of the film as it describes the obstacles in life Aicha must endure to succeed. While Turan holds her own for some of the basic techniques, she is doubled for more complicated moves by the likes of stuntwomen Lauren Kim, Rieko Hata, and Song Ying. As for Cyron Melville, like Turan, he was doubled for some of the more complicated moves but holds his own in the basic department. Denmark-based martial artist Behruz Banissi nearly steals every one of his fight scenes as Aicha’s potential rival Omar, who is quite an amazing martial artist who unleashes some nifty taekwondo kicking in his scenes. 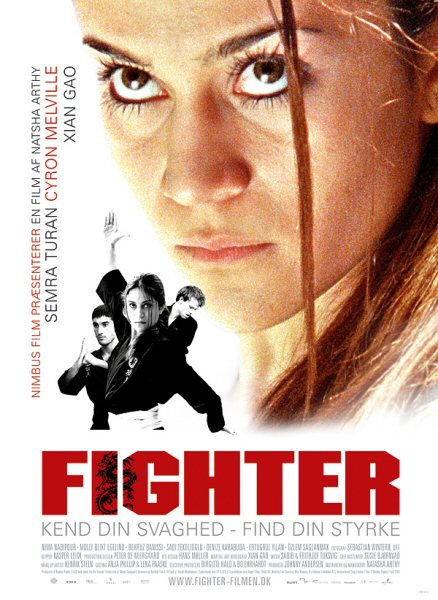 Fighter is definitely worth a watch as it is not just a typical martial arts film, but rather a look at someone conflicted to do what’s right in her heart and goes on a road to find herself. Nimbus Film presents a Nordisk Film & TV Fund production in association with Filmgear, Blixt Kamera, Angel Films, Danmarks Radio, Sveriges Television, and Det Danske Institut. Director: Natasha Arthy. Producer: Johnny Andersen. Writers: Natasha Arthy, Nikolaj Arcel, and Rasmus Heisterberg. Cinematography: Sebastian Winterø. Editing: Kasper Leick. Cast: Semra Turan, Nima Nabipour, Cyron Melville, Molly Blixt Egelind, Sadi Telelioglu, Behruz Banissi, Gao Xian, Denize Karabuda, Ertugrul Yilan, Özlem Saglanmak.